The sight or smell of something delicious is often enough to get your mouth watering, but the physiological response to food perception may go well beyond your salivary glands. New research in mice shows that the sight and smell of food alone may be enough to kickstart processes in the liver that promote the digestion of food. The study appears November 15 in the journal Cell. "This finding changes our view of one of the most fundamental processes in the body," says senior author Jens Brüning, an endocrinologist and geneticist and director of the Max Planck Institute for Metabolism Research in Cologne, Germany. "The perception of food in the brain activates the liver in such a way that it begins preparing to receive the nutrients that it expects to come." A previous study published in Cell in 2015 by another team of researchers found that sensory perception of food by lab mice was enough to trigger the neural pathways normally fueled by eating. Specifically, perceiving food inhibited AgRP neurons, which stimulate appetite, and activated POMC neurons, which induce satiety and suppress eating. The new study built on that research, focusing on how the changes in these neural pathways sent signals that affected metabolic activities in the liver. 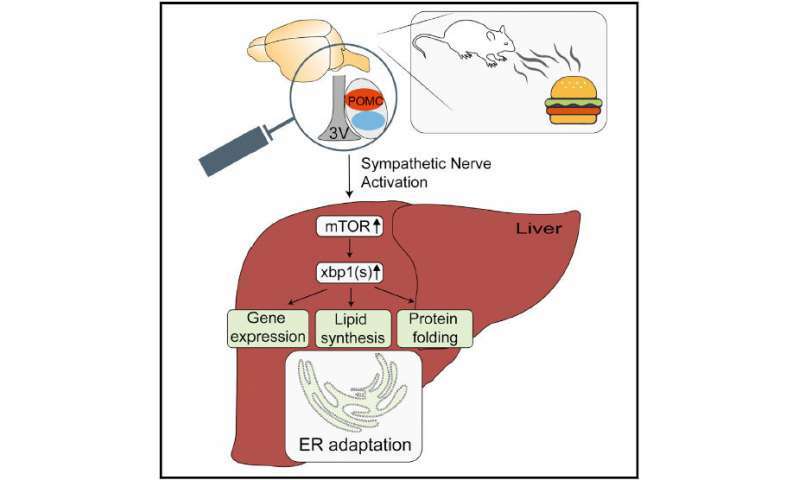 Here, the researchers found that within five minutes of lab mice perceiving food, the changes in POMC neuron activity were enough to induce a rapid signaling cascade that activated the mTOR and xbp1 signaling pathways. These pathways are normally activated when the liver takes up amino acids from digested food and help increase the protein folding capacity of the endoplasmic reticulum (ER), which assembles proteins from the amino acids found in food. "Our research shows that these changes in the liver occur in response to the mice seeing and smelling the food," Brüning says. "It's a whole coordinated program to prime the ER and get it ready for more proteins being synthesized and folded after eating." The researchers say the findings have potential implications for learning about the connections between obesity and diabetes, specifically by looking at the effects of protein folding on insulin release. "There's a possibility that this food sensory-dependent priming of the liver may be compromised in obesity. It could be a mechanism that contributes to insulin resistance," Brüning explains. "Obesity may leave the liver unprepared for protein folding after eating, which in turn could disrupt the normal insulin response. This is something we plan to look at in future studies using obesity models in mice." More research is needed before the findings in mice can be related to humans. The investigators are planning translational studies looking at insulin sensitivity in human volunteers who have been allowed to see and smell, but not eat, food.